One of the first fancy dinners I ever went to in San Francisco was at Michael Mina, back when it was located at the Westin. They have since moved and re-conceptualized a little, and I've been wanting to get back to check it out for ages. When I saw a seasonal, local crab dish on the menu for February only, I knew it was time to finally go. The restaurant itself is beautiful. Open, airy, elegant yet not stuffy decor, gorgeous custom designed servingware, plenty of space between tables so as not to feel cramped and private. Service was attentive and unobtrusive. The presentation and plating was lovely. Unfortunately, the food did not measure up. 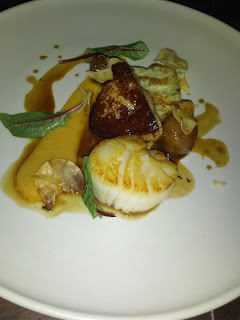 There was not a single wow moment in the entire meal, and several things were actually pretty bad (foie gras arancini, scallop). And most notably, it was most certainly not worth the price tag. And everything was really heavy. On the other hand, I did get to eat 9 desserts. The dessert here is offered only as a dessert service, you can't just order one, you have to get a tasting menu of 7 desserts. And they bring a pre-dessert dessert in addition to that, and they brought us a complimentary cake too. The desserts were not spectacular, but were good, and better than most of the savory dishes. Overall, I'm stuffed, don't feel particularly well, and am pretty disappointed, particularly given the cost. I did enjoy the experience of being there and having a slow paced meal in a beautiful setting with good company though! 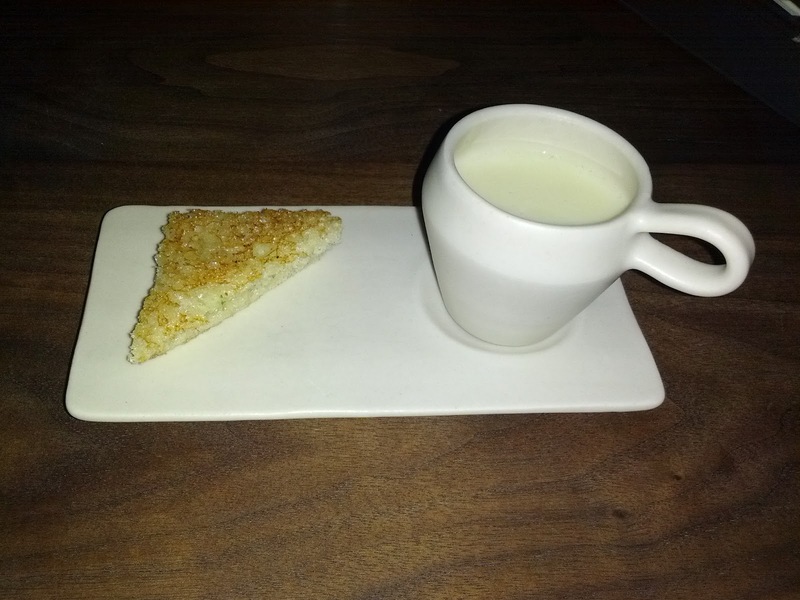 Amuse bouche - potato leek soup, Cowgirl Creamery Wagon Wheel grilled cheese. This is a cute idea for an amuse bouche, but was kinda heavy for a warm up course. The grilled cheese was fine, but not particularly noteworthy. Bread was heavily buttered and the cheese not really all that melty. The soup was creamy and comforting, but not particularly flavorful. Toasted sourdough bread with ricotta and honey. The bread was way, way too oiled for my taste. And sigh, sourdough, which I just don't really care for. 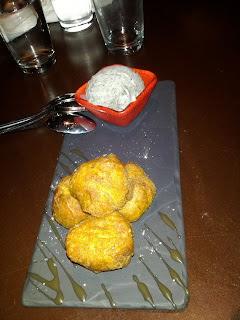 The ricotta and honey were delicious, as expected, and pair together really well. I just would have liked them more on a different bread and one that wasn't coated in oil. I think there was something else in the honey/ricotta pot (sesame oil? I don't remember). hors d’ oeuvres: steak tartare, foie gras ‘arancini’, smoked salmon terrine, dungeness crab ‘cake’. $48. Hors d' oeuvres platter consisted of 4 small bites for each of us. The platter for each person was $16, making each bite $4. They were definitely not worth that price. These all sounded fantastic, but completely failed to impress. 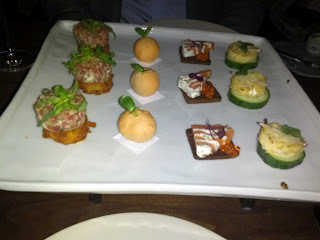 Steak tartar, served on a crispy potato cake: I liked the potato cake, but didn't care that much for the tartar. I don't blame the tartar though, I just don't really like steak tartar in general. Foie gras arancini: Well ... I thought this would be some play on a fried rice ball. There was no rice or fried, but it was a ball. I still don't know exactly what it was, but basically a foie gras truffle, perhaps mixed with cream? One diner described this as eating a ball of butter and said he wished he didn't put the whole thing in his mouth at once. 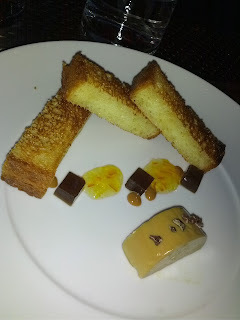 I didn't want to finish mine, and even my other foie gras loving companion didn't want any extra of this. Yes, we actually threw out foie gras. Smoked salmon terrine: Probably the best one on the plate. Smoked salmon, creme fraiche, salmon roe, on a little rye toast. Decent flavors, very cute presentation. I've had much more flavorful smoked salmon though. Crab cake: Not really what I was expecting, as it was very lightly pan fried rather than deep fried. I liked this as you really got to taste the crab. I have no idea what it was doing on top of a giant chunk of cucumber though. Bitting into it this way left you tasting only cucumber, the proportion was way off. One diner speculated that they wanted it to be the same height as the tartar? Regardless, deconstructing it to just enjoy the crab was the way to go. I wouldn't order any of these again, but the salmon and crab cake itself weren't bad. Crudo of hawaiian kampachi with pink lady apples, japanese uni, mitsuba, sea beans. $20. Well ... the pink lady apple chunks were tasty (the squares). The uni was decent. 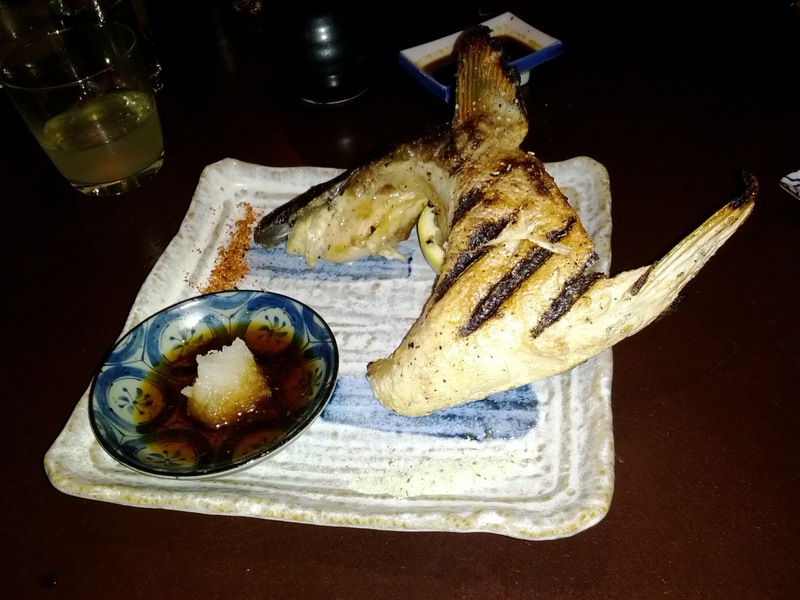 But the kampachi was incredibly flavorless. There wasn't anything wrong with the texture and it wasn't fishy or off-putting in that way, but it just lacked any flavor or freshness whatsoever. The assorted sauces on the plate were also pretty flavorless. This dish fell down hard, which is pretty surprising given its price per bite. One of my dining companions had the following to say about it: "I still can't believe that they served this. The kampachi was some of the most unpleasant foul tasting fish I've had in quite a while and I normally love Kampachi. By far the worst dish of the evening, I actually wish we would have sent it back, it was really that bad." This is coming from someone who I've never seen send anything back. Seared day boat scallop & foie gras, persimmon, sunchoke, red ribbon sorrel. $28. This dish was a mixed bag. It should have been fantastic: foie gras! Scallops! Persimmon! Some of my favorite ingredients. 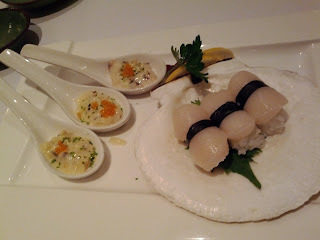 The scallop was nicely seared, but a little over cooked on the inside - I prefer scallops to be just slightly more rare. But ... it was really, really fishy and not fresh tasting. I love scallops and I really did not like this at all. I enjoyed the crispy sunchoke crisps. The foie gras was seared nicely and was pretty good, but lacked the creaminess I was really looking for. There were also some little potatoes and a cake thing, I have no idea what it was. My top savory bite of the night was a bite of the cake thing, with some foie gras, and some of the assorted sauces on the plate. The puree on the left hand side of the plate was particularly delicious, as was the foie gras sauce. That said, while this was the best dish of the evening, $28 for a single scallop and a pretty small piece of foie? Quinault steelhead trout, kataifi, arugula purée, lobster-mushroom royale. $34. 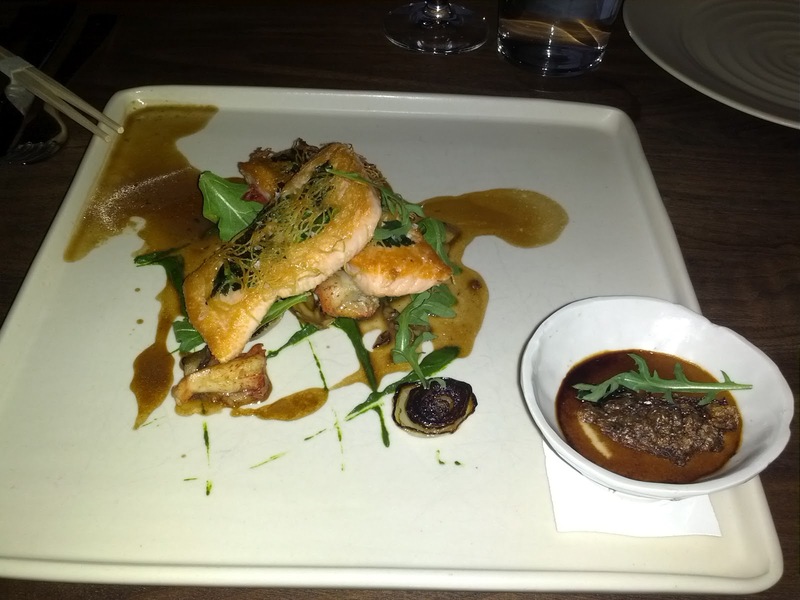 The trout was cooked well, with a crisp exterior, yet still pretty rare inside. The kataifi crust was really delicious. 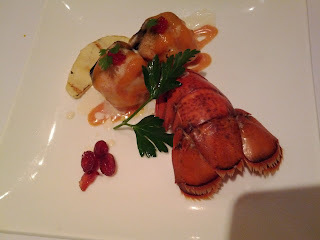 Also on the plate were some tasty mushrooms, lobster knuckles, and grilled cipollini onions. I've been really into cipollini onions lately, and loved that part. Sweet, grilled, delicious! The lobster wasn't all that flavorful or interesting. 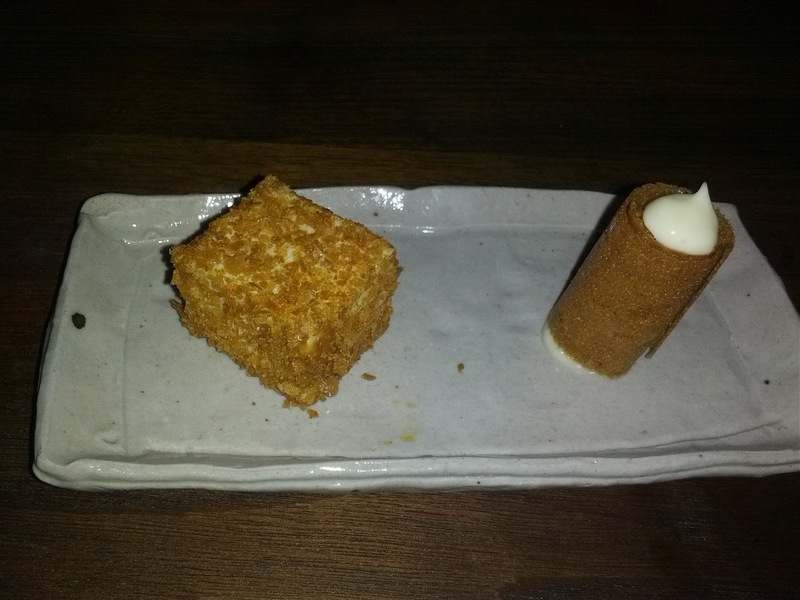 In the little dish was some sort of custard, with some sort of fried thing on top. I don't remember the details. One diner thought it tasted like foie gras, but I didn't really. Not bad overall, and not overpriced either. Japanese inspired whole dungeness crab, ramen, tempura, miso butter poached. $47. The dish we were more excited for! Local dungeness crab! This was presented nicely, they poured the broth in tableside. 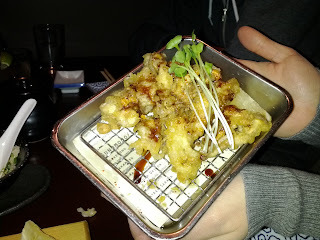 There were two tempura pieces - one claw and one other large piece. The tempura wasn't very successful - the batter was pretty soggy and not crisp, it was really oily, and why on earth would you want to coat delicious crab in tempura anyway? 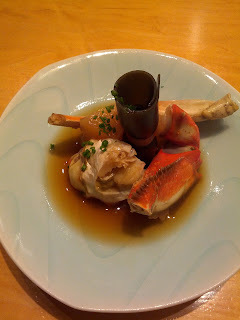 The 3 big chunks of crab (between the tempura pieces) were definitely the best, nice fresh crab, poached in miso butter. The ramen broth was pretty tasty, had some spice too it. Also inside the bowl was mixed greens, radishes, and some shredded crab meat. The little ramekin contained some sesame oil (?) that we were told to add to the soup as we wanted for flavor. It was actually really tasty and I would have loved to dip bread in it! I can't say this dish really came together for me. It was all good, but it failed to really wow me. That said, I probably enjoyed this ramen more than any other ramen I've had (except for ramen in Tokyo). It turns out crab ramen is way tastier than pork ramen! But again, $47? Just too high of a price for what it was. Olive oil and chocolate mousse cake, cocoa nibs, chocolate garnish, ice cream. The cake itself was ok, had a subtle olive oil flavor and was fairly moist. The chocolate mousse was much better when you just extracted a layer of it, rather than with the cake as it wasn't chocolatey enough to shine through the cake. The ice cream was forgettable, I don't even recall what flavor it was. The cocoa nibs added a great crunch and bitter flavor. Citrus pudding, cake, merengue, poppyseed candy. For something meant to be palate cleansing, this was far too sweet and heavy! The citrus pudding was sooo sweet. There was also a chunk of cake in here. The merengue was really frothy and kinda flavorless. The poppyseed thing was just sweet. Meh. I probably would have enjoyed this much more if it were served at dessert time, when I had some bitter coffee to go with it, but on its own, just too sweet. Really great decaf coffee! I've been on a quest to find good decaf lately and haven't really found much, but this was surprisingly good. Complex flavor. I still sorta don't believe it was decaf. 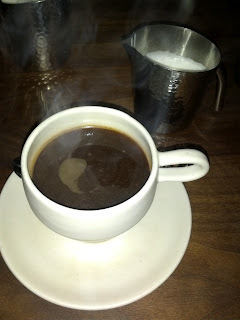 Served as a small carafe (about 4 cups) in a neoprene warmer to keep it warm throughout the dessert service. This was a fantastic touch, as it did indeed stay piping hot. It was also served with steamed milk. I love when places do this. I normally drink my coffee black these days, but I really like having coffee with a little milk foam on top. I don't know if this is a real drink anywhere, but I kinda made it up a while ago, and it is actually my favorite way to drink it. Sorta like a macchiato, but with coffee instead of espresso. Creamsicle: citrus cake, mandarin orange segments, buddah's hand, vanilla ice cream. 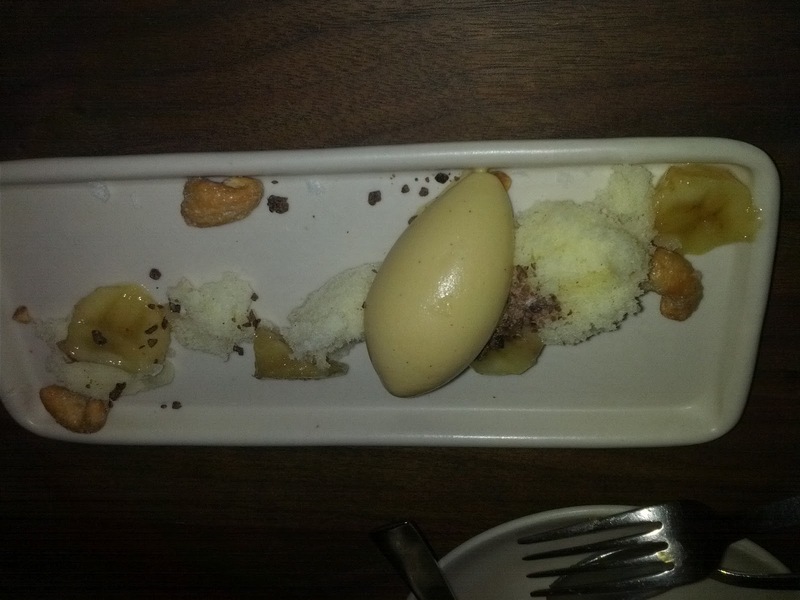 Course #1 in the dessert service (6 courses, $15). This was pretty good. The cake was surprisingly flavorful, full of citrus flavor. 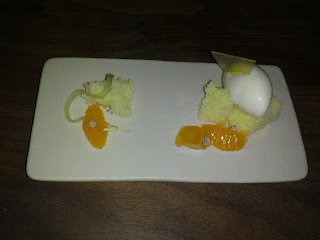 A bite of cake with ice cream and citrus segments was really refreshing and delicious, and did actually taste like a creamsicle. Not too sweet either! 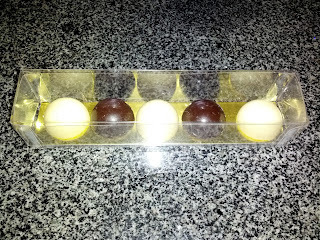 Briquette: caramel, apple, white chocolate. Brown sugar wafer with white chocolate mousse, jasmine. Dishes #2 and #3 in the dessert service. The briquette was a big surprise. 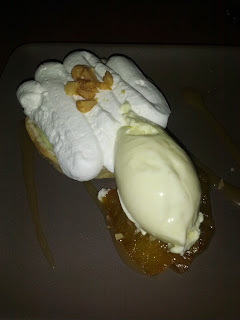 It was somewhere in between a marshmallow and a super soft merengue in texture, far fluffier than it looks. It was described as an inside out candied apple. 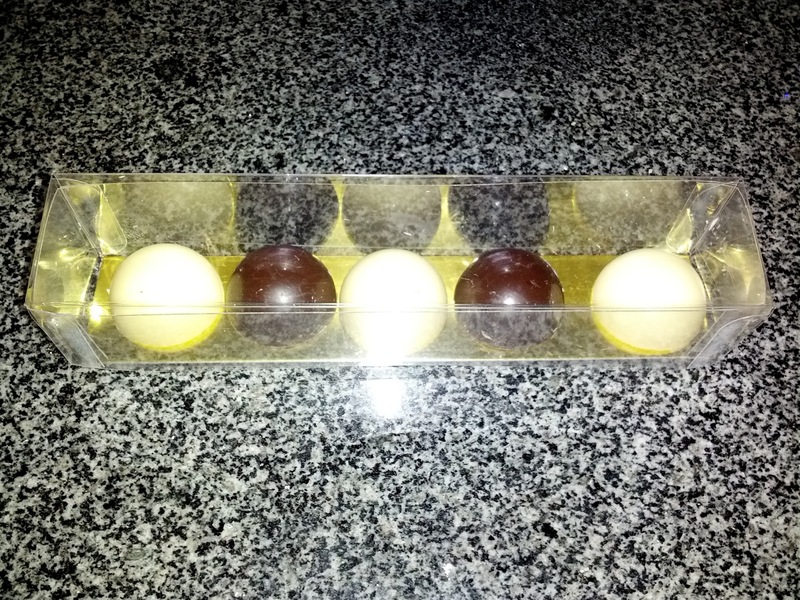 The main thing was white chocolate flavored, and it had some filling (apple?) and then was rolled in something crispy on the outside. It was flavorful, sweet, and just kinda strange. The rolled wafer was tasty. The wafer itself was brown sugar flavored and the filling was a delicious white chocolate mousse. Brown butter cake, rum bruleed bananas, candied cashews, cocoa nibs, flan ice cream. This was the winner for me by far. The bananas were enhanced by the rum. 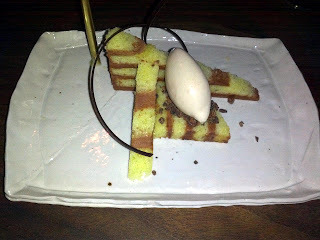 The cake itself was moist and flavorful from the brown butter. The candied cashews were just kinda there, not that interesting. The cocoa nibs again added a delightful crunch and bitterness. But the star was the flan ice cream - caramelly, sweet, delicious. If I wasn't in such a nice restaurant, I would have licked this plate clean. 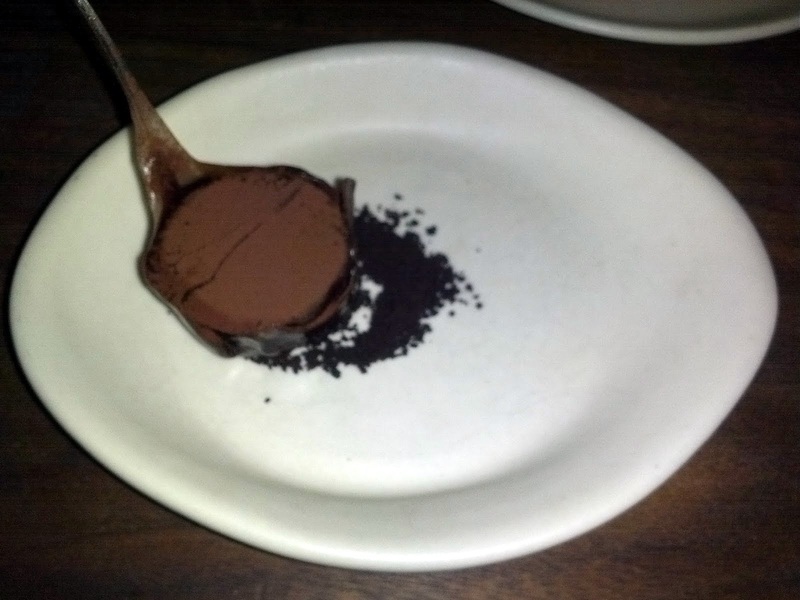 Chocolate ganache, in a chocolate shell, surrounded by candied chocolate, on chocolate soil. This one needed to be deconstructed. All together, it was just kinda a sweet overload. But, if you took it apart (mostly taking off the candied shell), it was a really creamy, flavorful chocolate ganache with a delightful chocolate layer to break through, and a bitter chocolate crumble to drag it through. And then, the candied layer was nice on its own. Walnut toffee and dark chocolate crisp. And finally, dessert course #6. Nothing particularly noteworthy here, just a piece of walnut toffee coated in chocolate. I eat brittle/toffee pretty much daily that is much better than this. It wasn't bad, but it just wasn't interesting either. 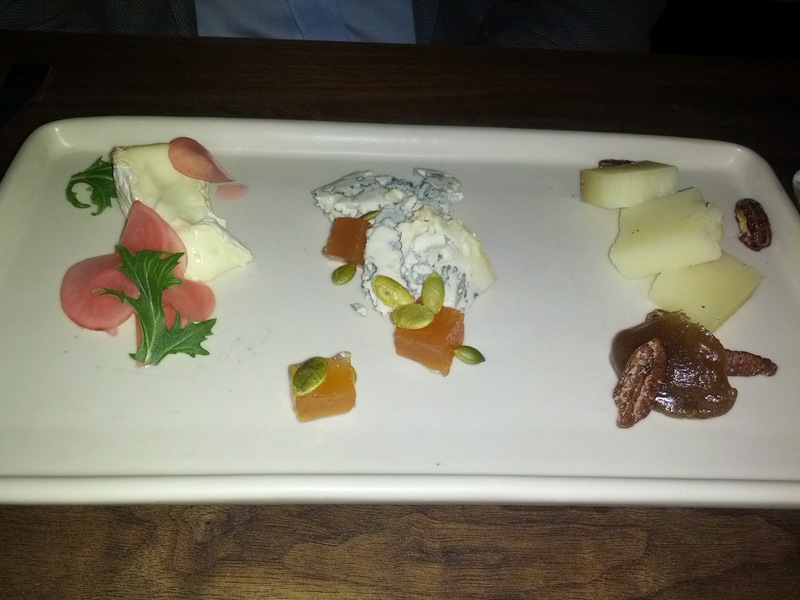 Cheese platter: Triple cream with pickled something. Fourme d'Ambert blue with passionfruit gelee and pumpkin seeds. Hard goat's milk cheese with candied pecans and date puree. $15. This was a fellow dining companion's dessert. After he consumed all of the cheese, he left behind the sweet bits, which I tried. None of the cheeses seemed particularly noteworthy. And ... more dessert. Additional treats brought to us by the waiter, usually just part of the tasting menu, but he gave them to us anyway. 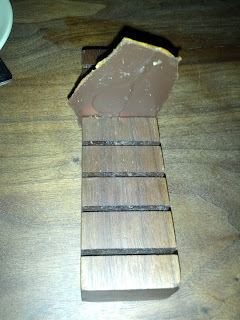 Dark chocolate caramel: Dark chocolate shell around caramel filling. Chocolate had a nice snap when you bit into it, shiny, decent. Caramel was ok, nothing spectacular. White chocolate filled with boozy ganache: White chocolate shell around some sort of boozy filling. Very boozy, but just sweet and gross. Anyway. I'm very familiar with Prospect, having dined many times in the restaurant and at the bar. It is the sister restaurant to the more established Boulevard down the street. They serve pretty similar food (seasonal Californian cuisine), although Prospect is slightly more casual and slightly cheaper. The space is considerably different however: Boulevard has a much older feel, although gorgeous and elegant. Prospect is more open, bright, and modern. Both have bar areas that are really fabulous to dine in, although I think Boulevard does not do a happy hour, or have a bar menu, whereas Prospect does. And that is what we were there to check out tonight! We started with a few bar snacks and cocktails off the Happy Hour menu, and then moved on to more food and cocktails from the regular bar menu, and of course, somehow wound up ordering dessert off the real menu too. 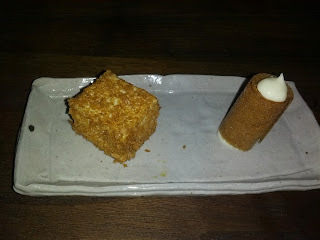 I was impressed with the bar snacks, they were really quite good and very reasonably priced (in general, my previous criticisms of Prospect have always been that the food hasn't blown me away and that it is pricey, so this was a contrast to how I feel about their main dining menu). The cocktails were really well done. My group ordered pretty much every cocktail on the menu, and I got a chance to take "just a sip" of most of them. 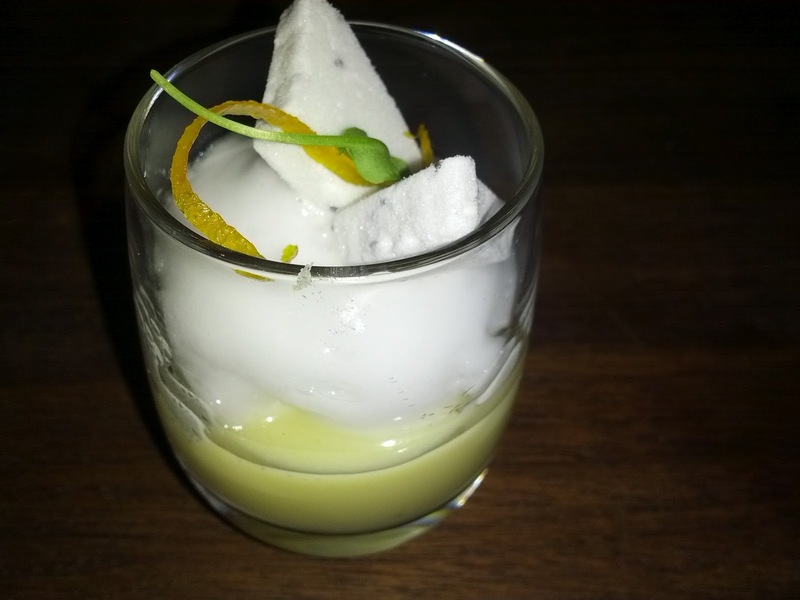 They were some of the most balanced and interesting cocktails I've ever had, ranging from fun and sweet to serious and bitter. Someone takes the cocktail program here very seriously, putting some major thought into the flavor combinations. These were complex drinks, with often surprising subtleties to them, particularly in the finishes. Very, very well done. I also have to give a shout out to the staff. The bartenders were friendly and social, without interfering with us in any way. They were busy, working constantly, yet somehow always managed to make sure we were taken care of. I felt very welcome and comfortable the entire time. Drop of Poison: Gin, Rhubarb, Aperol, Lemon, Absinthe, with candied rhubarb ($11). This one was pretty incredible. On the sweet end of the spectrum for sure, but so incredibly balanced. It had a really lovely finish to it. Plus, it came with candied fruit! Hemingway’s Brother: Rum, Grapefruit, Pineapple, Sage, Lime ($6). This was refreshing and light, not nearly as sweet as I expected from the description. Mr. Commons: Whiskey, Bitters, Sugar ($5). Nice and bitter, even though there was sugar added, this was definitely a whiskey forward drink, although it was sweet enough to please a larger audience. 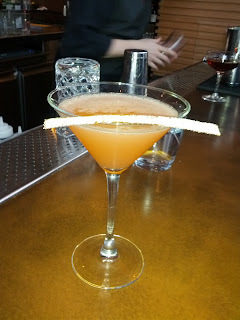 Prospector: Blended Scotch, Madeira, Benedictine, Bitters, Burnt Orange ($11.50). This was delightful, I liked it more than the Mr. Commons. Bitter but nicely balanced. And yes, it really did have a burnt orange, the bartender lit a piece of orange peel on fire before placing it into the glass. The Ambassador: Rye, Bonal, Apricot Eau-de-Vie, Zucca ($11.50). Another nice bitter drink. The Whaler: Jamaican Rum, Sparkling Wine, Blackberry Honey, Mint, Lime, Egg White ($11.50). I really enjoyed this one too (not surprising given the ingredient list I guess), sweet and delicious, with a foamy top layer from the egg white. I may or may not have stolen the remains of this drink from the owner when they temporarily orphaned it. Assorted standard cocktails: martinis, negroni. These seemed well made, and done just they way they were asked for. This was the least successful dish of the evening, but how much do you really expect from chips and dip? Partially I just wasn't really in the mood for it - I went from oysters and champagne to these, not exactly a smooth transition. Probably much more enjoyable with pizza or a burger! I also have a bit of history with chips & dip. My best friend in high school and I used to eat a lot of chips and onion dip. As in, every single time I went to her house we had some. Just plain old Ruffles and Lipton dip mixed with generic sour cream, but it holds a special place in my heart. And every family birthday party or gathering we had, my mom always served it as well. 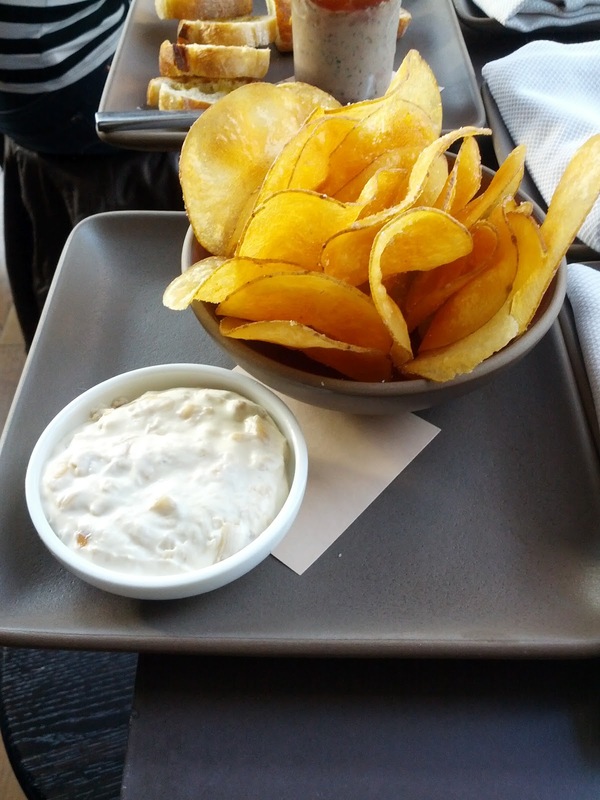 It is rather amazing to remember how much chips and dip we used to eat! Anyway, the chips were housemade and good enough, but incredibly oily. The oil didn't taste bad, and they didn't have the too fried greasiness to them, but it was very visible to the eye. The dip had some chunks of onion, but I didn't find it to be all that flavorful. The dip had a strange mouthfeel to it, it coated my mouth more than I am used to, I don't think it was sour cream based. I think I prefer my generic chips and dip, and for $5, this just wasn't really worth it. By the way, if you are looking for an awesome onion dip recipe, I highly recommend Heidi Swanson's Caramelized Onion Dip. It is time consuming to make, but absolutely insanely good. How can you go wrong with caramelized onions? And the dehydrated onion powder helps give it that classic Lipton flavor kick. This stuff is good with chips, but also really amazing as a dip for fries or as a baked potato topping. This however, was AWESOME. A generous jar full of pate, topped with some pepper jelly, and served with olive oil crostini, for $5. $5! The regular price is only $7. Incredible value. The foie gras flavor wasn't very intense, I'm guessing there wasn't that much in there, but it was very flavorful, studded with bacon. Yes, it turns out, even foie gras is better with bacon. 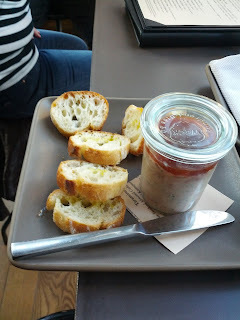 The bacon added a saltiness and smokiness that complimented the rich flavor of the pate so well. Even though we were putting generous amounts of pate on the crostini, we wound up with a bunch of pate left over without any crostini to spread it on. I briefly considered just eating it by the knifeful, but from previous visits, I knew the bartenders had a stash of focaccia that they serve with dinner, so I asked for a piece to use with our pate. The bartender offered to get us more crostini, but we declined and said the bread would be fine. It turns out, this was a genius move on our part - it went even better with the focaccia! The focaccia is Acme's herb and sea salt focaccia, buttery and salty, which added even more richness and depth of flavor to the pate. I'll definitely order this again. And I'd seriously consider just asking for the focaccia instead of the crostini. And because we have to order every foie gras dish in sight, we also got the other foie gras preparation from the bar menu. Served with toasted brioche, this had a fun breakfast feel to it. Get some really awesome toast, spread it with foie gras instead of butter, add a little marmalade, and a "sip" of coffee ... cute! Definitely a creative dish. The torchon was incredibly creamy and smooth. I'm not sure I've ever had it this creamy before. Unfortunately, it didn't have that strong of a foie gras flavor to it. It was topped with a few cocoa nibs, which provided a fun crunch and a bitterness that I enjoyed. Also on the plate was some citrus marmalade, a few tiny drops of dulce de leche, and some coffee gelèes. The marmalade sounded like a great compliment to the foie gras, but there wasn't that much of it, and I didn't really taste it. Perhaps if the flavor had been stronger, or had there been more of it, I would have been able to appreciate it. As it was, it was a throwaway component. The tiny little drops of dulce de leche were equally useless, even though I tried really hard to scoop up a bite to feature it, as I love dulce de leche and was curious how it would pair. The real interesting component to this dish was the coffee gelèe, not something I'd ever had paired with foie gras before (although, I've been reading about the pan seared foie gras with espresso sauce at Keiko a Nob Hill recently, which sounds amazing and like a similar flavor concept - indeed it was, see my later review). These gelèes, although small, really packed a flavor punch, so intensely coffee flavored. I was amazed at how much flavor even the tiniest little chuck of gelèe added. I have no idea how they managed to infuse the flavor like that! I am glad I tried this, (and really liked the brioche toast! ), but I probably wouldn't order it again. My friend ordered this because he knows I'm a dessert-o-holic, and even though I was protesting getting more food at this point, he knew I'd gobble it up. This dish was recently featured on a nationwide list of top 101 desserts, so I was excited to try it out. This was a cute little individual round pie! On top of the crust was a layer of sweet pineapple jam, then some pastry cream, tons of whipped cream, and some macadamias. The crust was decent, a little buttery and flaky, but a harder style than I generally prefer. The jam layer gave a pineapple flavor to the dish, but I didn't find it particularly interesting. There wasn't much pastry cream at all, which was disappointing since I love it, and I didn't taste the rum flavoring. There was however tons of whipped cream, which was well done, but, it was just whipped cream. The macadamias added a great crunch and the pineapple and macadamia flavors paired together very well. But overall, this was just overwhelmed by the whipped cream, which I didn't find particularly interesting. The ice cream had a subtle cream cheese flavor to it, but it seemed like a strange side to the pie. I'm all about pie a la mode, or ice cream sundaes with pineapple sauce and whipped cream, but a cream pie and ice cream just didn't really go together for me. These felt like two totally different desserts, both featuring pineapple, but put together on a plate for no reason in particular. This is similar to how I felt about the ice cream sandwich and creme brulee combo served at Boulevard. They were two dishes, tied together in concept since they both featured the citrus fruit, but eating them together didn't really make any sense. Perhaps I'm just not grasping the duo concept very well, as I love to combine little bits of every component on the plate, crafting up the perfect bite. The place is open, bright, and hopping. The bar is gorgeous, semi-circular, with all of the oyster offerings chilling on ice. They select one variety of oyster as the daily special, $1 before 6pm, $2 after, and have a huge selection of other oysters available as well. The oyster shuckers are hard at work in the bar area, impressively shucking oyster after oyster, ridiculously quickly and skillfully. 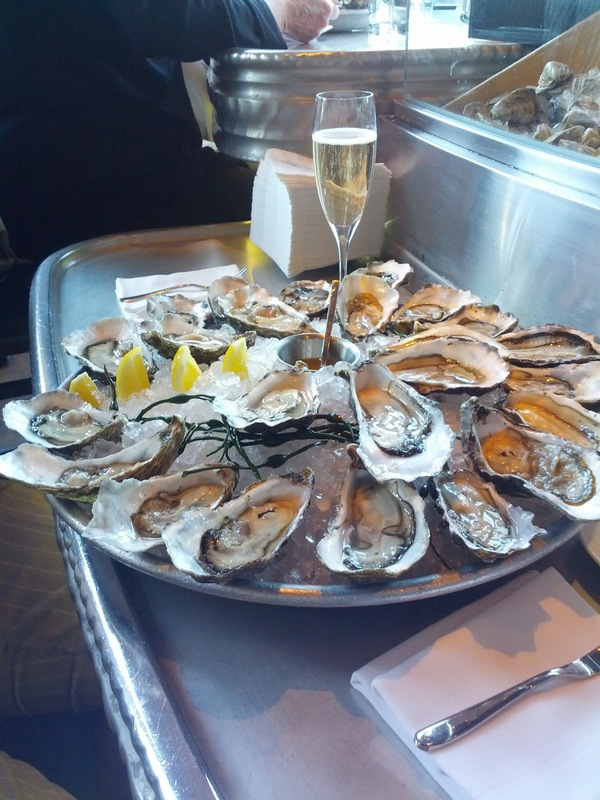 Since we'd just filled up on sushi burritos for lunch, and TGIF snacks at work, we only ordered the oysters (and champagne of course). The rest of the menu sounds fantastic, but all of the reviews I've read are so lackluster that I've never been willing to risk it, particularly given that its pretty pricey. Seems like it falls in the category of over-priced-not-good-restaurants-with-a-view. Do you recommend checking it out for a full dinner sometime? Marin Miyagi: rack & bag; northern Tomales Bay; deep cup, sweet, mellow flavor. Normally $2.75 each, so at $1 each, they were a good deal. I generally prefer smaller, sweeter oysters, or ones with a more briny flavor, but these were decent. Not particularly good, but they were clearly fresh and well cleaned. Seems like a solid choice for fresh oysters, particularly at happy hour prices. 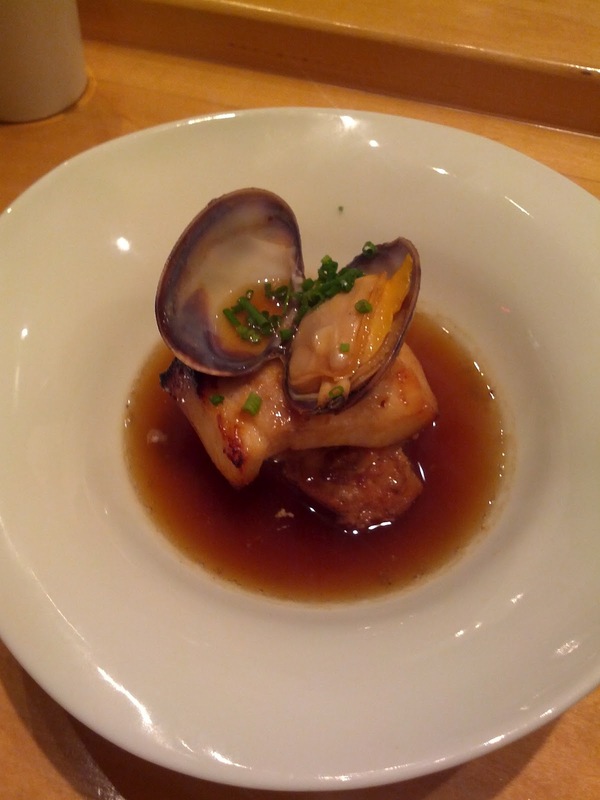 Tonight we went to Kiss Seafood, in Japantown. The place is adorable. 3 tables, 5 seats at sushi counter. The entire staff is a husband and wife: she is the waitress, he is the chef. You need reservations, and you need to make them at least two weeks in advance, even for mid-week. They do two seatings: 6-6:30 and 8-8:30. The meal takes about 2 hours. I liked sitting at the sushi counter and watching the chef, it was pretty impressive how he did all of the work, cooking the hot dishes, making the sushi, etc. Very methodical and in control of his kitchen! The menu is small: a few cooked appetizers, and then a few choices for sushi - sashimi plates in a few sizes, sushi plates in a few sizes, or two omakase options. You do not have the option to just order specific pieces. I'd read enough reviews on Yelp to know that we should do the omakase, the "special" omakase, which was $68 and included 6 courses - salads, cooked dishes, sashimi, nigiri, soup, and melon. 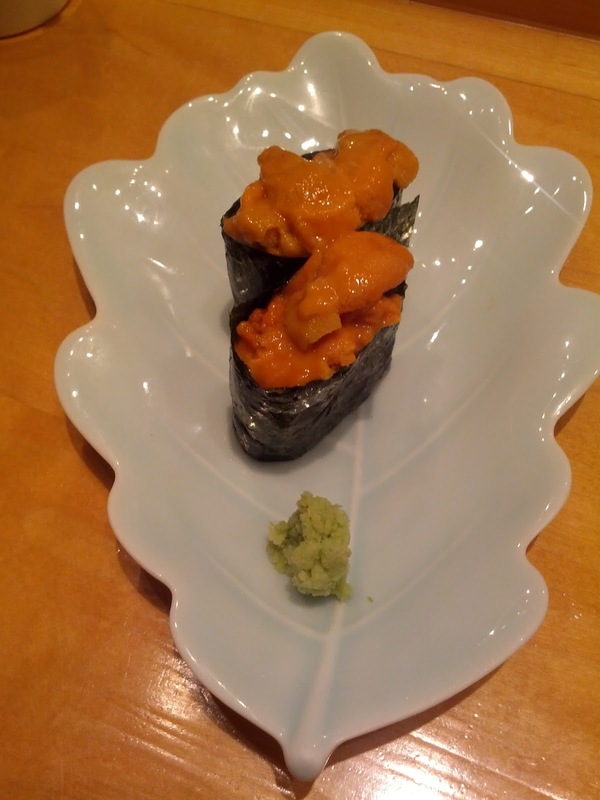 We also added on some specials that I couldn't resist: dungeness crab and uni! Everything here was ok, but not particularly memorable or worth waiting two weeks for. I had high expectations given the crazy good Yelp reviews it gets, but I wasn't wowed by anything. 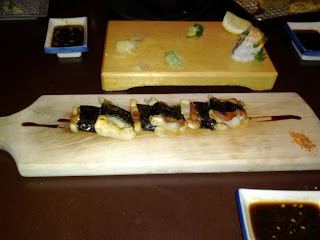 I think I enjoyed the cooked dishes more than the sushi, which I really wasn't expecting. Value-wise however, it was quite good. And it was adorable, I liked the atmosphere quite a bit. Casual and very traditional. The best part of the evening was walking a few blocks to Moyo and getting the taro frozen yogurt with mochi! I didn't care that I was stuffed or that it was freezing out, that was some creamy, flavorful yogurt and the mochi was soft and delightful. Complimentary starter: noodles, shredded diakon, tiny little fried sardines. This was fairly boring. 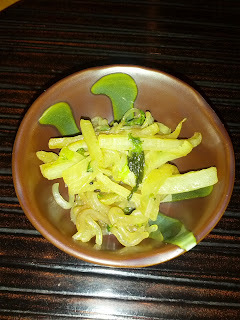 The noodles were a little mushy, the diakon was not very crisp, and there wasn't a whole lot going on flavor-wise here. The only interesting part was seeing tiny eyes and discovering the sardines! 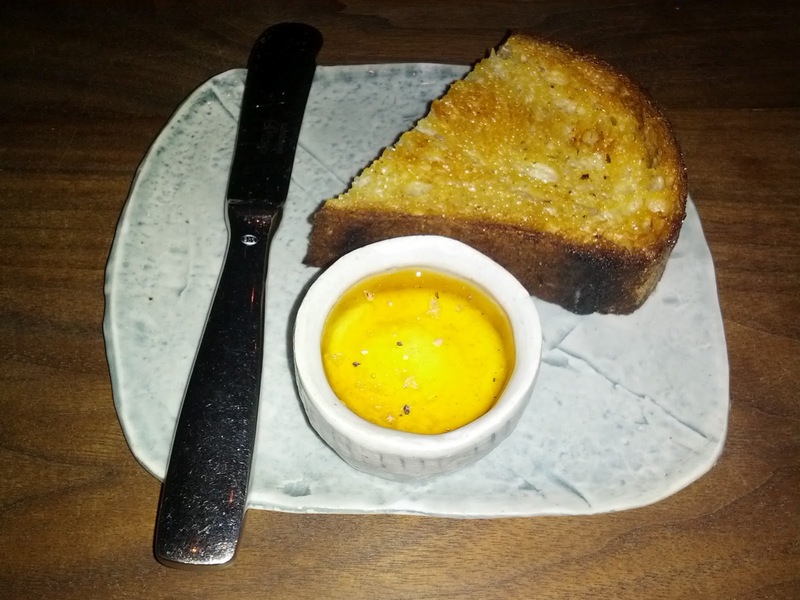 (We had no idea what was in the dish as it wasn't described to us at all and was just their amuse bouche). Dungeness crab special: Crab leg, claw, body with diakon and kelp, in a light dashi broth. 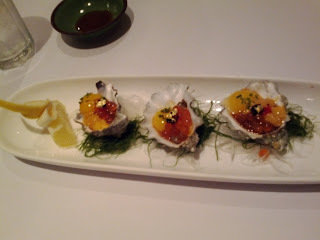 Extra appetizer we added on to the omakase. This was one of the specials for the day, and I can't resist ordering local dungeness crab when I see it on a menu! The crab was pre-cracked, so all we had to do was extract the meat with the provided seafood fork. 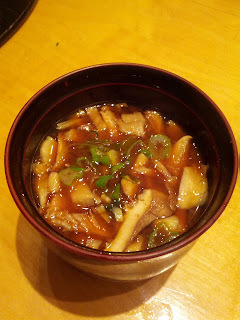 The diakon had been cooked/stewed and was really soft and flavorful. The kelp added extra interesting flavor, but didn't really go with the dish. 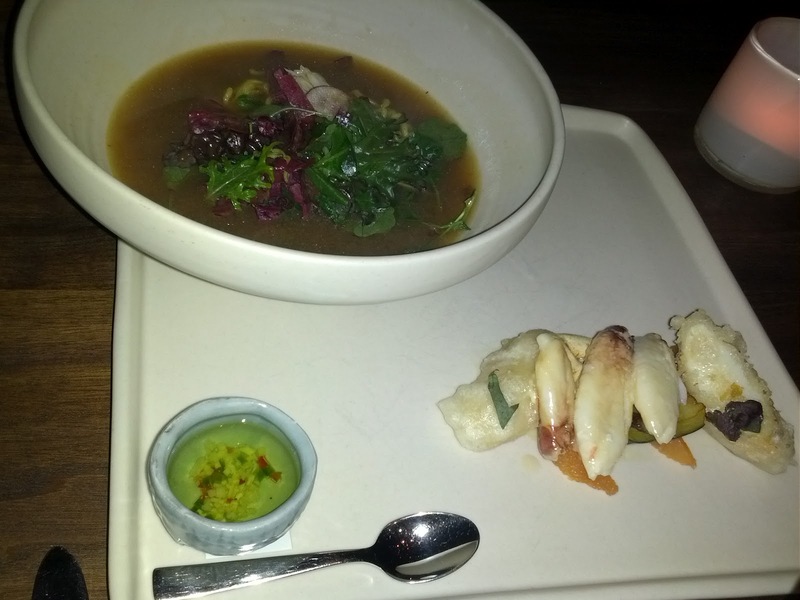 The broth was light and flavorful, but was mostly just there from the crab being simmered in it, as there wasn't really a way to eat it or to get bites with much of it. Overall, this was fine, but not particularly memorable. Strangely, the diakon was my favorite part of the dish, I found it far more satisfying than the crab itself. 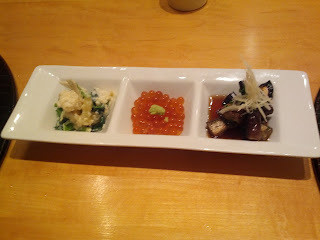 Omakase dish #1. I really did not like the tiny dried shrimp cakes in the first salad. They were kinda crunchy and weird, but I loved the tofu sauce on the spinach. It tasted sorta sesame-like as well, but I didn't see any sesame, although it could have been a paste. I would have gladly eaten more of the spinach with sauce! I'm not a huge fan of roe, so the roe did nothing for me. Seemed just like standard roe. They provided a little spoon to eat this with. The eggplant was pretty boring, in a kinda vinegary sauce. Forgettable. Omakase dish #2. For the most part, not a very good assortment of sashimi. While none of it was bad, it wasn't really all that good either. The strangest part was the cuts, we had some very peculiar shapes. Snapper: had the skin on, which I did not enjoy. The flesh of the fish was kinda gooey. Did not like. Textures were doing things here that really don't belong in sushi! Clam: firm, chewy, with a fishy taste. Didn't really like this (not that I normally like clam anyway). Amberjack: the flesh was nice and firm, the fish flavorful. The cut was really strange, small little cubes. King mackerel: Another one with the skin on. There was a third piece of this hiding in back that was a strange cut, much thicker, and square. The fish was flavorless. 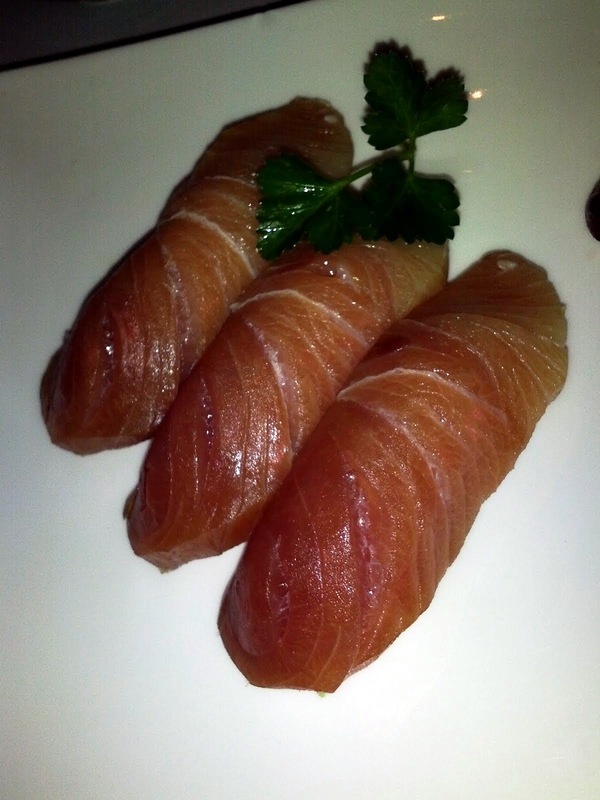 Toro: Nice and fatty, buttery, soft, the best piece on the plate. Baby stripped bass: Firm, a little fishy, and a little stringy. The wasabi was fresh wasabi and had a great kick to it. 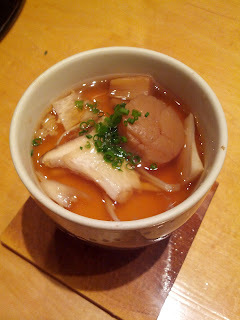 Cooked yellowtail, turnip, lotus root, clam, in a light broth. Omakase dish #3. I really enjoyed the yellowtail in this dish. It was nicely cooked and had a great texture and flavor. The clam was plump. The turnip (or was it radish?) was a little refreshing, but I didn't really like it, particularly compared to the stewed diakon in the crab dish. The lotus root was really starchy and I didn't like it much at all. I think I'd only ever had lotus shaved thin and fried like chips before, so this was a good experience to try it out in another preparation. I think it was fried here too? Broth was forgettable. Chawanmushi with steamed halibut, egg custard, dried scallop, mushrooms, in a light soy/dashi/mirin broth. Omakase dish #4. My first time having chawanmushi! I really liked the experience of eating this, it felt so much like comfort food (reminded me of mashed potatoes or mac and cheese or something like that). The very bottom of the bowl contained some steamed halibut. It was nice to have the pieces of fish in there, but they weren't particularly interesting. That was topped with the egg custard that made up most of the bowl, and then the dried scallop, mushrooms, and chives. The mushrooms were mushy and overcooked. The dried scallop was a strange texture, kinda stringy and firm. I've never had dried scallop before though, so that was nice to try. The custard was lovely, creamy, smooth. The broth was pretty flavorful as well. I'd love this on a rainy day! Another thing I can't resist when it is on the specials menu: uni! So we added this on as well. This was japanese uni, which does feel silly given how close we are to great uni sources here. Creamy, fairly flavorful, decent. 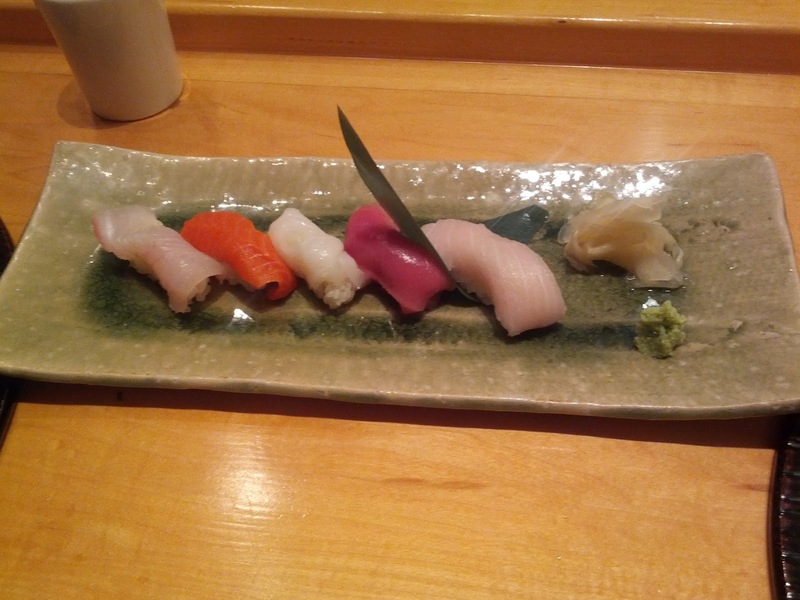 Nigiri - halibut, wild salmon, octopus, bluefin, yellowtail. Omakase dish #5. 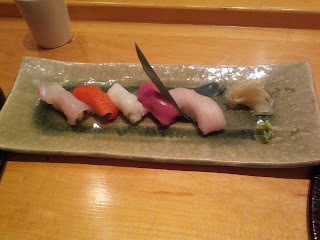 The nigiri was MUCH better than the sashimi. I liked the size of these pieces, so many places give you pieces that are too big to eat comfortably. Halibut: firm, good texture, but not much flavor. Wild salmon: firm, nice flavor. Probably my favorite piece of raw fish for the night. Octopus: chewy, did not like, but I don't tend to like octopus. Bluefin: Nice and soft, really flavorful. One of my favorites. 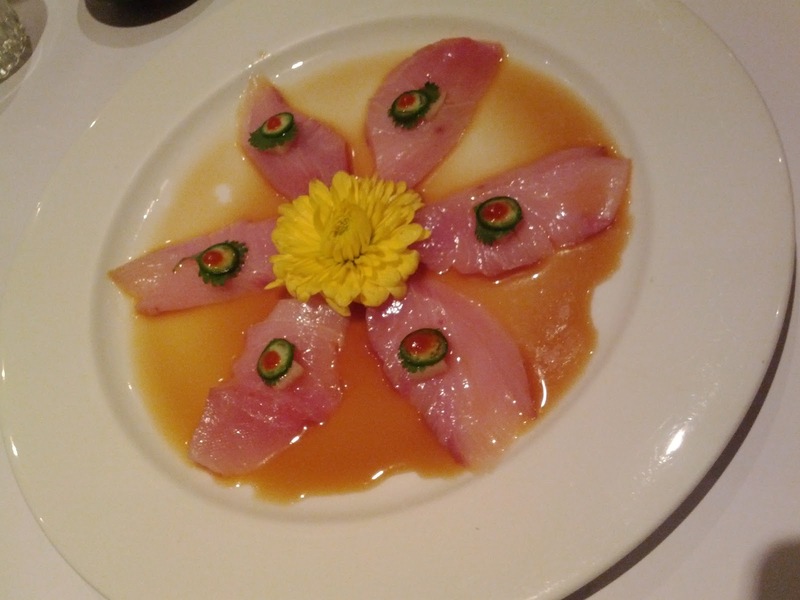 Yellowtail: Firm, great texture, flavorful. Omakase dish #6: Soup loaded up with mushrooms. I thought the mushrooms, like the ones in the other dish, were mushy and overcooked. Broth wasn't particularly interesting. Meh. Omakase dish #7. I didn't eat this because I'm allergic to several types of melon, and didn't want to risk it on an unknown melon. Japanese Izakaya in the Marina. Overall: nothing was bad, but nothing was really good either. Food menu is extensive, spanning raw items, grilled items, fried items, desserts. We tried some of it all. Drink menu had lots of interesting cocktails, sakes, shochu. Pricing: Not bad, but we had a 30% off Blackboard Eats coupon. Without it, I probably would have been grumpy at cost/tastyness tradeoff. Service: Had an 8pm reservation, got seated around 8:10. Drinks took a long time to arrive. Timing was very strange - started off nicely paced, then we got bombarded with dishes, and then we had a very long wait for the last one. I'm guessing it was just different parts of the kitchen working at different speeds, but it was a little off putting. Finished dishes were not cleared very quickly. Ambiance: We had a nice booth, plating was usually a little interesting (dishes came on things that looked like slates ... but were actually plastic). Random note: They liked to garnish everything with a lemon or a red spice rub. Yuzu: sake, yuzu juice, prosecco and honey. Sweet, decent. Lime-Ginger chu-hai: Nice lemon/lime flavor. House made lime ginger soda: sweet, gingery, good flavors in there, but not well developed. 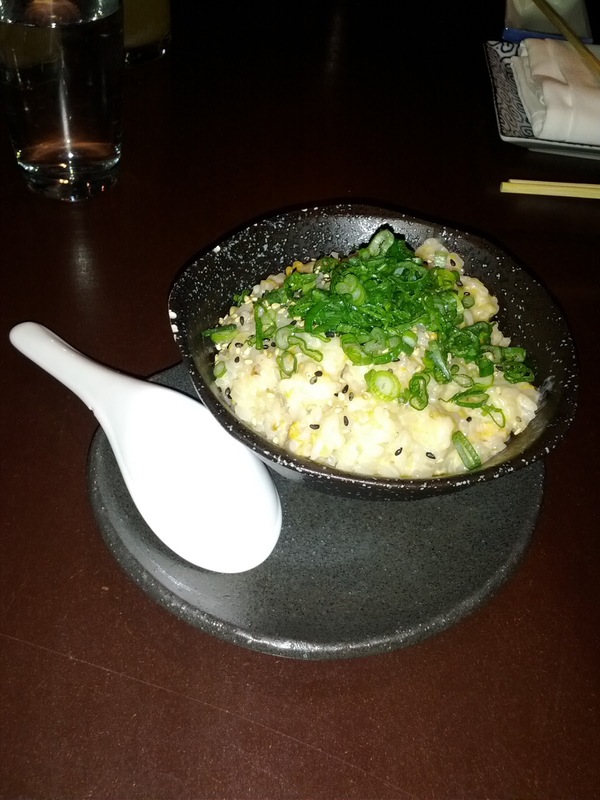 Uni gohan: uni “risotto,” shallots, garlic, parmesan cheese, green onion. The rice itself was well cooked, the warmth and cheesyness made it fairly comforting, but this didn't really pop for me. Flavors didn't seem that well developed. Uni was pretty lost in it, occasionally adding a hint of richness. Standard sushi roll. Decently made, decent quality ingredients, but nothing all that special. The cilantro inside was a little fascinating. I did appreciate the spice from the slices of jalapeno rather than just spicy mayo. Would eat again, but not worth going out of way for. Way too fried. Ratio of batter to mushrooms was off for me. Very oily. And kinda old nasty tasting oil at that. Would have preferred the sweet soy sauce as a separate dipping sauce rather than already drizzled on in order to get more sauce! The Yelpers rave about this so we had to try it, plus, it did sound fantastic. I really didn't like it. I love bacon and mochi, so I thought this would be a home run, but it didn't work for me at all. I prefer crisp bacon, this was soggy. The whole thing was very greasy. Mochi was gummy. The two rice balls are different: one filled with umeboshi (plum) the other with katsuo (bonito flakes). This was the most interesting dish of the evening. The outside of the rice balls was really crisp - my favorite part of rice (I love scraping the bottom of the rice pot to get the crispy bits, or having the tadik). 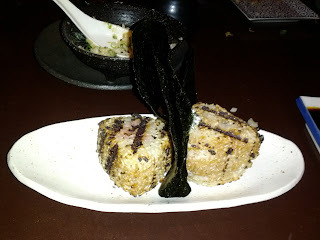 To eat it, you wrapped it in the provided nori. I also dipped it in soy sauce. But ... the flavors just weren't there and the rice inside the ball was kinda mushy. I could definitely see liking something like this elsewhere though, conceptually, I really liked it. 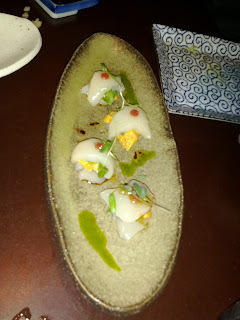 This was decent, but it was exactly the sum of its parts: decent quality raw scallop, decent quality uni. They combine together ok. Nothing more, nothing less. Decent, but the consensus at the table was that Sushi Zone does better. I found it to be very inconsistently spiced - some bites were crazy salty, some were really flavorful with whatever the red spice rub is that you see on the corner of the plate, others were just plain and lacking. The bites that were well spiced were really nice and fairly addictive, which kept me going back for more, only to get let down by a bland bite! Another Yelp recommendation that led us astray! Perhaps we should have realized this from the quality of the fried mushrooms and not ordered? 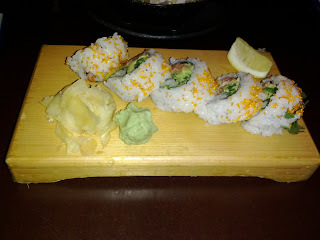 We went to another new sushi restaurant tonight, as part of my quest to try out new sushi places. This one we knew was going to be an "interesting" experience, as the sushi menu was full of things like foie gras, lamb, duck, and fruits. I read through a bunch of the Yelp reviews and knew that the lamb and duck weren't supposed to be great, but reviews for all of the other unique sushi were good, so I had high hopes. Protip: don't trust the Yelpers! In all seriousness, I'm glad we tried this place, as it really was a unique experience. The presentation of the dishes was generally quite nice. They were trying very interesting things. And they take reservations! Unfortunately, the quality of the fish was just not there, and all the creamy sauce just couldn't mask that fact. It was mostly mediocre quality, with one piece being actually good (the live scallop) and a few pieces being really awful (hamachi, oyster). The fruit was even lower quality than the fish. I know I'm spoiled by eating pretty much exclusively farmer's market fruit, but this stuff was pretty flavorless, and it just didn't go with the fish well at all. I also have no problem with fruit in my sushi, as I love a lot of the rolls at Sushi Zone that include mango and papaya, and one of my favorite pieces at Sushi Sam's has kiwi on it. So, it isn't just that I don't like fruit + fish. There were a number of execution issues as well, such as the fruit being sliced too thick and the ratio of rice to other ingredients being off in a few of the pieces. The pacing of the meal was also off. The first 6 or so dishes arrived rapid fire, faster than we could finish the ones before it. Since some of them were hot/seared, this was overwhelming. The waitress recommended things to us that were really not good and did so unsolicited, definitely trying to upsell and get us to order more. And the price certainly was high for the poor quality, $70 per head for 12 pieces of sushi each. I don't mind paying a lot for good quality fish, but this was very high for what we got. I most likely will not return here. See photos for individual reviews. We ordered our sushi, and then the waitress talked us into ordering this. She said it would be a great appetizer. It was the worst dish of the night. 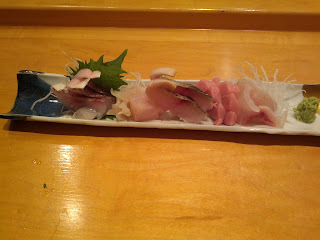 The quality of this hamachi was horrible, some of the worst fish I've had in recent memory. The little slice of jalapeno on it was nice, as was the dot of hot sauce, but this was pretty bad. I sorta wonder if she was just trying to upsell us, I forgot to look on the bill to see how much this item was. Ceviche: Halibut and salsa wrapped with deep fried seaweed and served with lime and sea salt. This was a cute idea, a play on ceviche. To eat it, you wrapped it in the seaweed and ate it taco style. The halibut itself was decent, but I didn't really get any flavor from the salsa and definitely didn't get any lime or salt flavors. The strangest part was that the seaweed was dripping wet. I think it must have been with oil from being deep fried. Cute idea, but was lacking in the promised flavors. 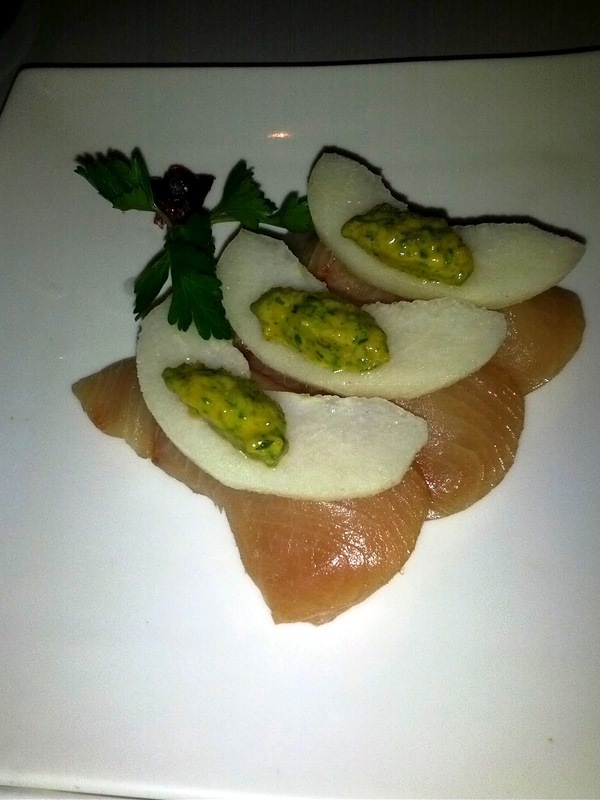 Hamachi Pear - Yellowtail sushi topped with sliced pear and kabuto fruity mustard sauce. 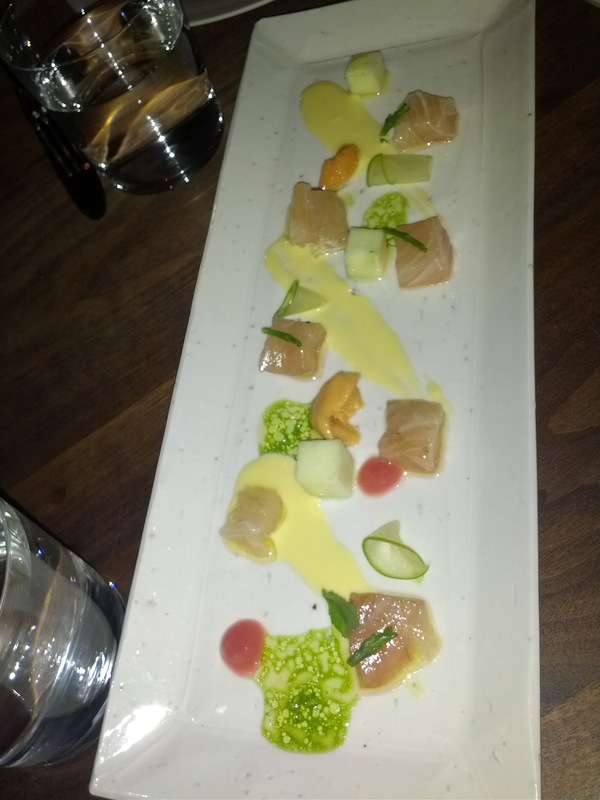 The "fruity mustard sauce" was pretty tasty and it worked surprisingly well with the pear and with the yellowtail. The hamachi was fairly decent, far, far, better than the hamachi used in the appetizer. The pear didn't work though - sliced too thick, and lacking any flavor, it just made it hard to eat and weird. 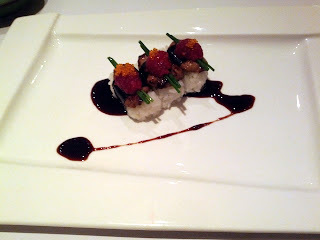 Foie Gras Sushi - Seared marinated goose liver served with balsamic raspberry sauce, raspberry, chives, roe. The piece of foie gras was pretty tiny, particularly given the quantity of rice, so the flavor was drowned out by the rice. This is too bad, as it was decent foie gras and did go quite well with the raspberry and the raspberry balsamic sauce. This either needed more foie or less rice. I guess there is a reason why you don't normally have foie gras sushi ... Still, it was interesting and I'm glad I got to try this one. I liked this - decent quality lobster, seared in a way that gave it a grilled smokey flavor. It was nothing like Sushi Sam's baby lobster though, which totally sets my standard for baby lobster dishes (at Sushi Sam's, it is not seared, a much smaller baby served almost whole, and covered with amazingly delicious mayo sauce). I have no idea why there was a random piece of seared fruit on the plate. Or more dried cranberries. They so did not go with it. Ono grape - Wahoo sushi topped with grapefruit and basal basil cream sauce. I didn't like this one. The flavors just did not come together at all. 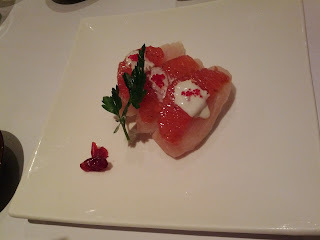 Why was there grapefruit on my sushi? Why the cream? The grapefruit was pretty flavorless, poor quality. And the fish wasn't particularly good. Meh. Shrimp & Crab Tartar sushi - Chopped shrimp and crab mixed with Kabuto tartar sauce served with egg yolk, capers, anchovy, cilantro, and grape. This was probably my favorite dish of the night. Basically, a shrimp and crab salad, on top of some seaweed, on top of rice. It was kinda impossible to eat though. You can't see it in the picture, but there was nigiri rice under the nori, I'm still not sure how on earth you were supposed to do this. 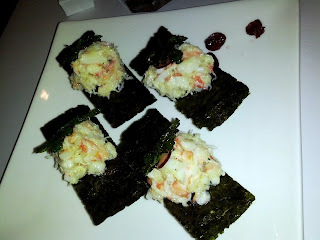 Although I thought the flavors were great and really enjoyed the crab/shrimp salad, it didn't really make sense as a piece of sushi, and I'd just prefer to have the tasty salad on its own. 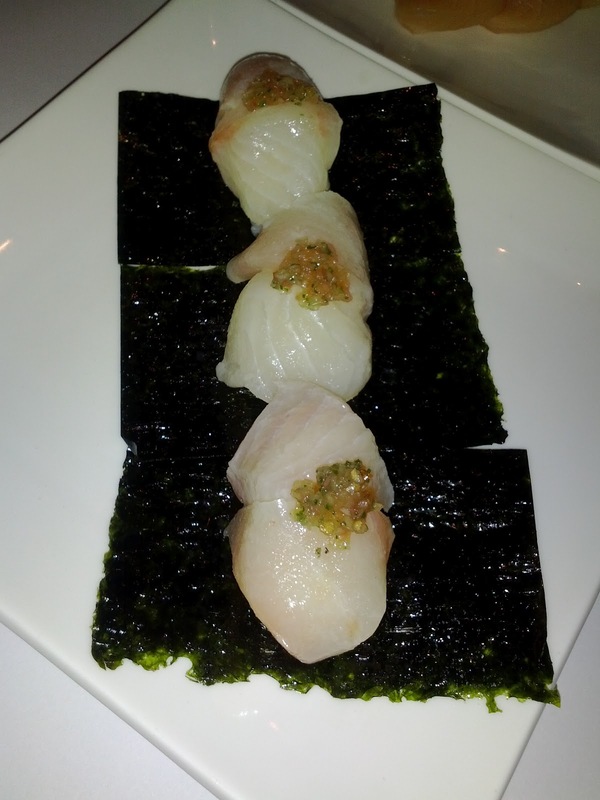 Live scallop - scallop nigiri, scallop chowder. The scallop was just standard nigiri but very good, tender and fresh. My second favorite piece of the night. The scallop chowder wasn't good. I couldn't really determine what anything was, just that it was probably some sort of chowder base and the somewhat chewy stuff in it must have been scallop, perhaps cooked? 1849 Oyster: Oyster, quail egg, 3 types of roe, uni, gold leaf. 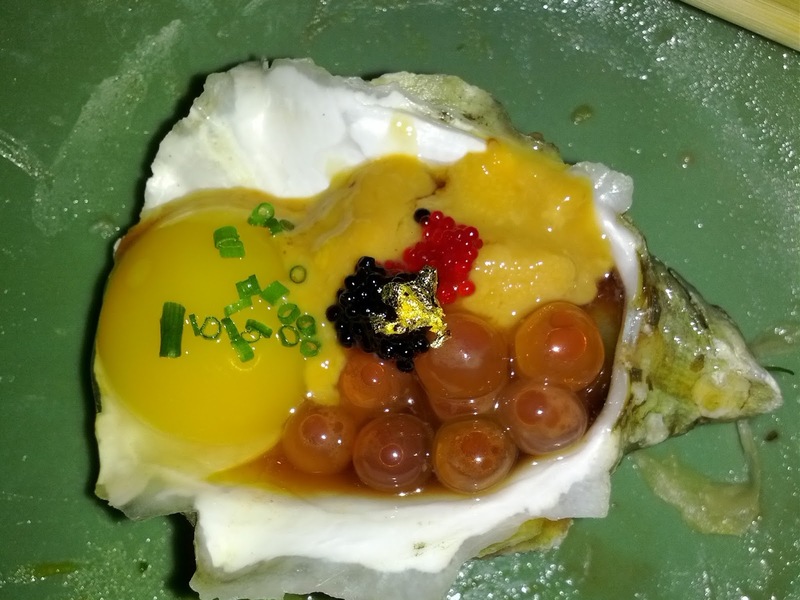 Close up of 1849 Oyster: Oyster, quail egg, 3 types of roe, uni, gold leaf. This is one of their special famed dishes. It reminded me of the "Spoonful of Happiness" we got at Koo a couple weeks ago (that was uni, quail egg, roe, ponzu), except the spoonful of happiness was MUCH better. There was a lot going on here. The uni was decent, but the quantity was so small you didn't get to taste it that much. I'm not a huge roe fan, so all this roe didn't thrill me, but it did add to the experience to have it popping in your mouth as you took this all in. The quail egg added a richness. I can't say I tasted or noticed the gold flake :) But ... my oyster was pretty nasty. Very fishy and not in a nice briny way. If the oyster had been better, I could see this being pretty ok, but as it was, it left a horrible taste in my mouth. Hot Apple - Seared Scallop served with apple and fruity mustard sauce (says the description ... this was a creamy sauce instead). This was similar to the baby lobster, seared with a nice smokey flavor. 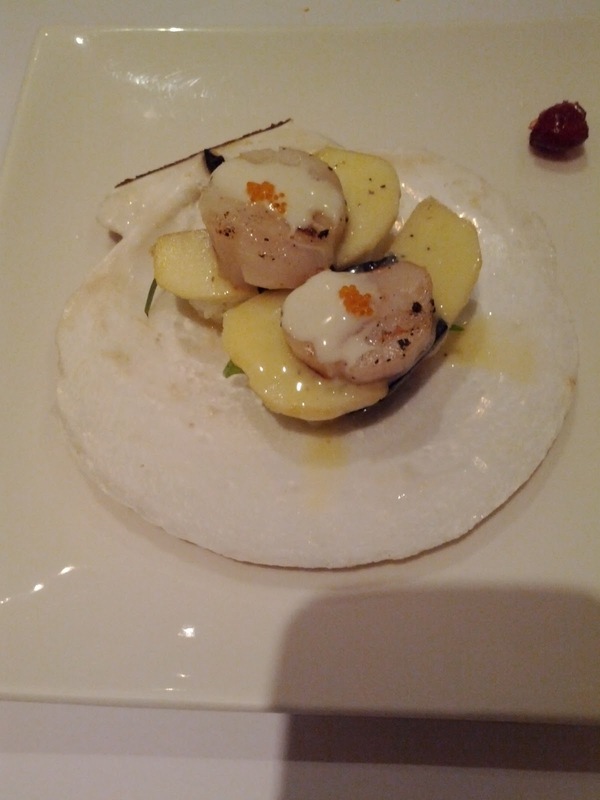 But the quality of the scallop was poor, and it was tough and way overcooked. It didn't go with apple at all. The description said it had a "fruity mustard sauce", which the hamachi pear piece also said, but the sauce on these was not even remotely the same. The hamachi pear one did have a fruity mustard sauce ... this one had a fruity sauce and a cream sauce. I definitely did not taste any mustard. 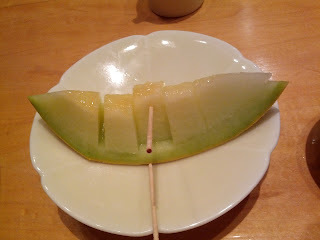 And like the hamachi pear piece, the apple was sliced too thick and was poor quality. You can't see it, and the description didn't mention it, but there was a piece of shiso leaf under the apple, that was actually really nice and crisp and refreshing, and went really well with the apple. 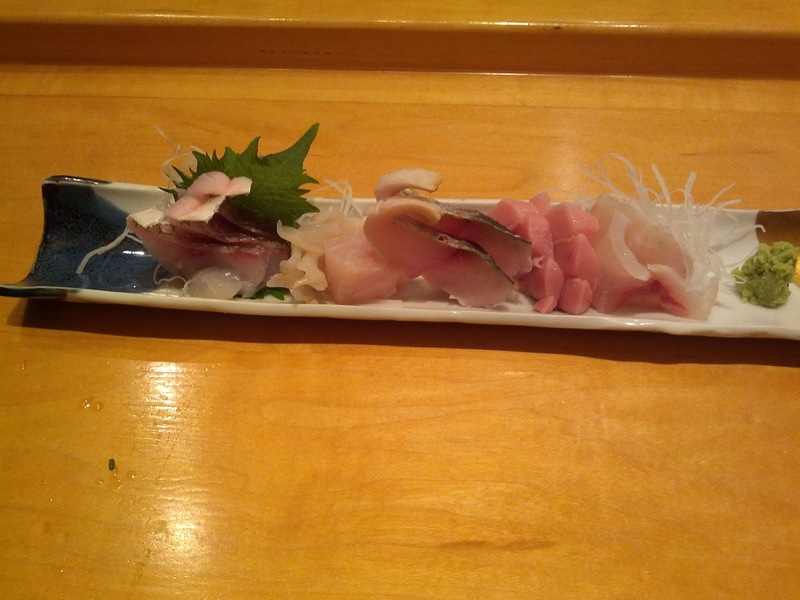 At the end, we wanted to give them one more chance, and decided to order nigiri off the fresh fish of the day menu. This SHOULD be the best stuff they have, and we were sick of the "special" sushi with its cream sauce and bad fruit. We ordered the butterfish, but the waitress told us this was the freshest thing of the day and the best. So we got it instead. Again, she led us astray. This was the second worst thing of the night for me (after the hamachi jalapeno she recommended). Seriously, do not take her recommendations! I didn't even bother trying the tamago.